Baruch Hirson, South African Trotskyist, provides some insight into the South African syndicalists of the early twentieth century recovering the history of South African left traditions ignored or caricatured in the South African Communist Party and academic accounts. Although his interest was in the Communist Party and the Trotskyists that emerged subsequently, his work also touched on the anarchist and syndicalist tradition, as this interesting paper shows. The following 1993 text by the late Baruch Hirson, South African Trotskyist, provides some insight into the South African syndicalists of the early twentieth century. A reader can quibble over the focus on Archie Crawford and Mary Fitzgerald (whose ideas were always rather mixed), as well as regret the closing in 1917 (many of the most important developments took place in the late 1910s). But credit must be given where credit is due: Hirson played an unmatched role, over many years, in recovering the history of South African left traditions ignored or caricatured in the South African Communist Party and academic accounts. Although his interest was in the Communist Party and the Trotskyists that emerged subsequently, his work also touched on the anarchist and syndicalist tradition, as this interesting paper shows. Paper for discussion on 12th November  at 5.0 p.m. Language was always going to be a problem when groups, articulate in one or other European language, tried to reach out to other sections of the polyglot society. Even those socialists or trade unionists who canoe from Britain were not always able to communicate their ideas to Afrikaners, and certainly not to speakers of the many European tongues. Although there were trade unions that emerged with little or no connection with European organizations, many (white) working class unions were started by men who had previous affiliation with British unions, and in some industries the South African unions were affiliated to their British counterparts as local branches. However distance, and the different social conditions, led to industrial action that was quite distinct from any activity in Britain. The affiliation to the ‘parent’ union in Britain became a mere formality and the attachment was eventually severed. The problem of white exclusiveness in the early socialist groups and the trade unions extends beyond language and can be traced, firstly to the tight segregatory pattern of political representation, of housing, education and social welfare that governed the country and, more recently, to the different positions the ethnic groups occupied in manufacture and industry. The white workers, whatever their place of origin, or their social standing in the larger white community, became part of a settler society. Their housing and schooling might have been inferior, but they were citizens of white South Africa. They had the vote, were better paid and entitled to a certain degree of social welfare. Above all else, as workers, they were employed in skilled or semi-skilled trades, had certain occupations reserved for them and were allowed the right to apprenticeship. 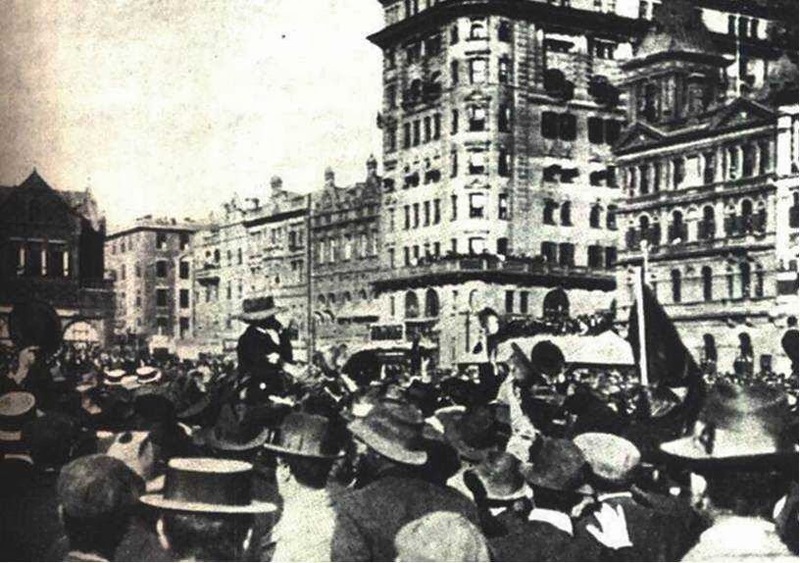 Their trade unions were recognised (albeit after some bitter struggles) and their right to bargain and to take strike action was achieved at an early stage of South Africa’s industrialisation. Africans were denied most of these rights. Besides the policy of enforced segregation, leading to the removal of entire urban communities to townships outside the towns, the vast majority of black workers were housed in compounds in the first decades of the 20th century – and this included the 200,000 black miners, the brick workers, the municipal workers, most of the dockers and railway workers, and so on. The peculiarity of South African industrialization, commencing with mining, lay in two interconnected factors. Firstly that mining, the predominant industry until at least the end of the Second World War, maintained rigid divisions in the work force. This established a pattern in contrast to practice in factories in Europe, where the introduction of machinery tended to break down the divisions inside the working class.5 Secondly, that the predominance of the mining houses in the South African economy acted as a barrier to further industrialization until the post-depression years in the 1930s and the entry of South Africa into the Second World War. Thirdly that the continued use on the mines, of a recruited and migrant labour force, which was still tied to the land and was predominantly unskilled, tended to separate these labourers from the settled white working class – both because of the differences in skills, and also because, the white workers were utilised on the mines, initially as ‘gangers’6 then as supervisors, and certainly as ‘superiors’. This also set the pattern for separation in most factories or workshops. It was claimed that the black workers, who left their families in the Reserves, would work for lower wages, because their families were partly sustained by the crops they grew on their allotments – except that is, when the crops failed. On those occasions the urban workers, under pressure from their families, demanded more money. It is not my purpose to examine the validity (or morality) of the claim that the people in the reserves could manage financially, but only to observe that the assumption was made and became the accepted ‘norm’ allowing the mines to reduce the wages of African workers to a mere pittance. The effect, furthermore, whether intended or not, was to irrevocably divide white from black workers. The white workers, whose standard of living was well below that of the white community as a whole, nonetheless fought to maintain their wage level and inevitably contrasted their ‘white South African’ standard with that of the African. It was also assumed by white women workers that they had the right to (and they demanded the money for) the employment of a black house servant/nanny. The National Party, after it came to power in 1924, in conjunction with the South African Labour Party, used the same divisive factor under the pretext of introducing a ‘civilized labour policy’ as their contribution to the solution of the ‘poor white’ problem. In sum, the possibility of uniting black and white workers, either in trade unions, or in a socialist movement (with a few notable exceptions), was made nugatory by the nature of industrial policies and employment practices until the 1980s, at least. The restricted nature of industrialization in the country meant that white workers supplied most of the required operatives and that the entry of Africans into the towns were restricted to those who could show they had employment. Legislation was also introduced after Union to make it possible for the Minister to remove ‘agitators’ from the towns and this acted as a deterrent to organization. This, together with the shifting population in the town, was partly designed to prevent the formation of a black proletariat – and it was at least partly successful. But not altogether. Despite the constant movement between town and country the African, while in the town and in employment quickly adjusted himself to work conditions and developed the means to struggle against bad work conditions, low wages, or other perceived iniquities. Without necessarily forming formal trade union groups, workers, from domestic servants through to mine labourers, boycotted shops, marched and demonstrated, campaigned against the pass laws, or came out on strike.There are accounts of such actions in 1913, 1918-20, and thereafter. But there are as yet only incomplete records of earlier actions, organized by African workers – usually on an ethnic basis – and conducted by themselves with remarkable efficiency. Yet, in all those early struggles, white and black, workers seldom co-operated, took action separately and even clashed. It is therefore not possible to speak of the existence of a syndicalist movement in South Africa, if by that it is meant that workers were organized into one all-embracing industrial union.7 Yet, there were persons (almost always white), either in one of the socialist groups, or in one or other trade union, who were syndicalists, and it is possible to trace some of their ideas and some of their activities.8 Their impact was not negligible and that is the most important reason for following their careers. There have been few personalities like Fitzgerald in South African labour history. She would have been a Fenian had she stayed in Ireland, or a member of Narodnya Volya if she had been in Tsarist Russia. Her temperament and heroism would have taken her to the heart of any social issue wherever she was. Yet, even in her lifetime she was forgotten and apparently ignored. Crawford and Fitzgerald had started the Voice of Labour in 1908, using the small print shop that Mary had bought. Crawford was the editor, Mary was in general charge, and correspondents wrote from Cape Town, Durban and elsewhere. The paper originally gave its support to a General Workers Union (and initially distributed copies free of charge as a token of solidarity with the GWU), then it gave its support to a series of socialist groups, all opposed to the Labour Party and following the position these groups took. Because of Fitzgerald’s association with the Women’s Enfranchisement League, the paper gave publicity to its activities. In so far as a policy guided the paper it tended to be syndicalist – although it did not espouse an anti-parliamentary position. It was an eclectic paper, giving publicity to Gandhi’s campaign and reporting that an African trade union was being contemplated by someone called Zini. But the outcome of that venture appears to have been negative. The paper also reported on affairs abroad and was particularly scathing about events in Tsarist Russia. At one stage Crawford embarked on a round-world trip that took over a year to complete, to meet syndicalist groups in the English speaking world, and his reports appeared in the paper – managed throughout by Mary. When the white miners came out in mid-1913, Crawford and Fitzgerald were omnipresent. They marched at the head of the miners from pit to pit. Crawford added to his reputation when he addressed miners who were undecided on strike action. Addressing the workers he would call on strikers to stand on one side, scabs on the other and it always worked. There were no scabs. Finally Crawford, as chairman of the Federation of Unions was in the Trades Hall, Johannesburg, when the troops rounded up the men who were said to be leading the 1914 general strike, With another eight men, Crawford was placed illegally on SS Umgeni and deported. Mary sailed for Britain and joined him. When war broke out they were both caught in the jingoism of the time and that put an end to their radicalism. The other dominant figure of the time with a syndicalist viewpoint was Andrew Dunbar. Always opposed to parliamentarianism he moved in and out of most socialist groups. He called for One Big Union and in his speeches always declared that if the workers came out in a general strike, they would defeat the ruling class. He said this to black audiences when he spoke on the pass laws – in this case saying that they could make the laws unworkable by crowding the jails; and he said this to black workers when he lectured to them at the IWA. But of this below. “I should pay one tribute to the marvellous influence that has been exercised be De Leon’s works and SLP ‘philosophy generally’ here during the last year or so”. “…had made Marx a name to be reverenced, and the time is not distant when his true successor De Leon will be given his due place among the great ones of Socialism”. Jones wrote one further letter to the SLP on 9 July. He asked for copies of the party’s catalogue and if possible, he wanted the printing matrices of existing publications for production in South Africa. The ISL adopted De Leon’s call for industrial unionism, or one big union, and incorporated it into the League’s objectives at the Second Annual Conference in January 1917. It now read: ‘To propagate the principles of International Socialism, Industrial Unionism, and anti-militarism’. Actually, the ISL had been pursuing this goal through most of the year, thereby criticising the exclusiveness of white workers and urging the organization of black workers alongside whites. Headlines in the International (the ISL paper) through 1916 indicate the trend of thinking. On 17 March, the lead article headed ‘Segregation Segregated’ concluded ‘Capitalism, even more than our socialism, compels us to seek for the application of the Internationalist principle to the native, or confess Internationalism bankrupt’. Two weeks later there was a ‘Call to the Native Workers’, the report of an address by George Mason (who had urged blacks to support the miners strike in 1913) on ‘Trade Unions and the Native Question’. Referring to the miner’s strike in 1913 and the tailors’ strike in December, when Malay tailors joined white strikers, he said to acclamation from a mixed audience, that the result of the strike in January 1914 would have been different if black and white workers had fought together. “The employing class, which exploits all labour without prejudice of colour whether it be white, black or yellow, so long as it is cheap, strives nevertheless to perpetuate that colour prejudice in the ranks of the workers themselves. The white worker did not stretch out the hand and there were no signs of progress on these lines. However, the ISL secured the attention of leading members of the SANNC (later renamed the ANC) and on occasion, some attended the League’s public meetings. This was an important development and it was followed in mid-1917 by moves to launch a black general workers union, the Industrial Workers of Africa in 1917, under ISL aegis. This initiated a history of socialist involvement in black trade unions and marks the first (albeit hesitant) step in placing the black working class at the centre of the struggle in South Africa. One final word on the syndicalists needs comment. Despite several attempts at establishing a group after the war, it seems that those involved were scattered and small in number. They did not have their own publication and instead sent reports to and sold the British paper Workers Dreadnought, edited by Sylvia Pankhurst. Individuals (including Dunbar) reported on events during the 1922 general strike. Their articles were bitter and showed few new insights into what has happening. Despite their support for the strike, the articles they wrote indicate that they stood on the periphery of events, unable to influence what was happening. Thereafter they faded out of existence. Anon (nd), ‘Biography of Mary Fitzgerald’, typescript. R K Cope (cl944), Comrade Bill.The Life and Times of WH Andrews, Worker’s Leader, Stewart Printing, Cape Town. Mary Fitzgerald (nd), ‘Autobiography’, typescript. Wilfrid H Harrison (nd), Memoirs of a Socialist in South Afiica, 1903-47, Stewart Printing. Lou Haysom (nd), ‘Mary Fitzgerald’, an untitled typescript. B Hirson and Gwyn Williams (1993/4 – forthcoming) The Delegate for Africa, The Life and Times of David Ivon Jones, Core Publications, London. A Lerumo (1971) [M Harmel], Fifty Glorious Years, Inkululeko Press. John Philips (1978), ‘The South African Wobblies: The origin of Industrial Unions in South Africa’, Ufahuma, 8,3. J H & R E Simons (1969), Class and Colour in South Africa, 1850-1950, Penguin. Voice of Labour. I only have an incomplete set. The same copies are available at the Institute of Commonwealth Studies, London. 1. Jack Erasmus, a journalist, of whom little is known, came from New Zealand. Harrison says of him that he declared he came to South Africa ‘for the purpose of introducing socialism’ (p 4). He was active in early socialist groups in Cape Town, then moved to the Rand where he worked on the Rand Daily Mail. 2. I refer here specifically to the Yiddish speaking branch(es) of the International Socialist League at the end of the First World War. But even in the early 1930s the first left opposition group in Cape Town used Yiddish as the medium of discussion at its meetings and members of the Jewish Workers Club in Johannesburg usually spoke Yiddish. I do not know of similar branches for German, Italian, Netherlands or other groups, but many kept their identities in local groups and their discussions were in their home languages. 3. Such contact as existed between white sympathizers and the Indian campaigns before 1914 was usually at leader level was restricted to a small coterie of white intellectuals and did not lead to the transmission of political ideas from the whites to the Indians. On the contrary, the white sympathizers absorbed, or were influenced by, Gandhi’s political philosophy. 4. I am not certain when the Cape unions opened their membership to Coloured workers. However, there is no indication that they recruited African workers to the unions. 5. Although developments in the second half of the century ,with some mechanisation underground, led to a reduction in the division of labour, mining, like other pre-industrial revolution occupations (e.g. building), have maintained strong divisions among the work-force. 6. A ganger acted as a sub-contractor, directing his gang of men in blasting and extracting ore. The white miner was paid by results, and he paid members of his gang of men according to results. 7. Tom Mann, speaking as a ‘revolutionary socialist’ said that there could be no industrial unions without Africans, as far back as 1910 See Cope, p. 110. This is also quoted by Philips. 8. I know of no organizational documents, of no memoirs and no records. Thus, except for the newspaper Voice of Labour, of which there is an incomplete set, and the British paper, Workers Dreadnought, I have had to rely almost entirely on secondary sources – namely, Roux, Harrison, Phillips, Simons and Lerumo. 9. Cope, pp. 111, 117. The biography of Andrews drew heavily on accounts supplied by Andrews – and his obvious dislike of the syndicalists means that the story in Cope requires confirmation. 10. There is an account in Cope. Like much of this work, the story, which certainly attracts attention, is seen through the eyes of Bill Andrews. Lou Haysom has a fuller and more accurate account, and avoids the errors in the anonymous biography and in Fitzgerald’s scrappy account. Haysom’s work was never completed. 12. Once again there are problems in the story. Cope is skimpy and so are the Simons. I have had to weigh the fact that these are authors who generally gave scant attention to persons or groups that were either not in, or were opposed to, the CPSA. I have therefore accepted Haysom’s account, drawn partly from the two available biographies (Anon and Fitzgerald). Haysom also draws on accounts from Mary’s sister about the detonators. Until Haysom’s account, it was accepted that detonators and dynamite was placed on the rails by provocateurs. 13. Cope, p. 112 ff. 15. Quoted in Hirson and Williams, chapter 8. 16. A full account of this will appear in Hirson and Williams. This work is being prepared for the press.